This great artwork by Vestìe Davis sold for $5700! Introducing Auction Bay Classics - great success stories from years past at your favorite consignment store! We’ve been open for over 4 ½ years now, and there are many items to share, so make sure to watch for these old favorites! 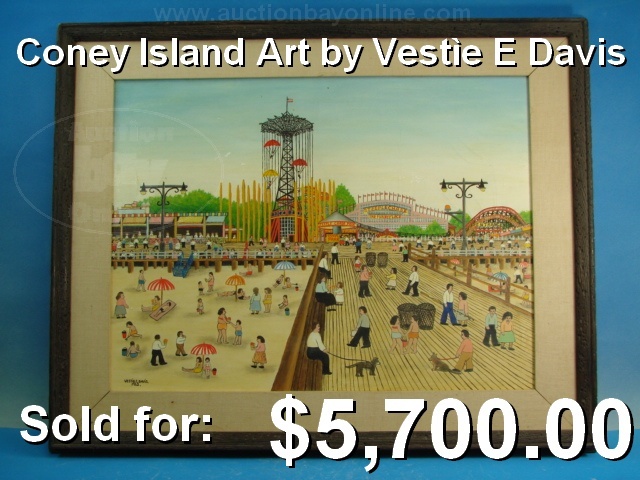 Back in 2008, a consignor brought in a lovely artwork done in a charming style, which captured a scene from Coney Island. The art was signed in the lower left corner as painted by Vestìe E. Davis, who we discovered was worth learning more about! Born in Baltimore in 1903, he worked as a circus barker, newsstand manager and undertaker in New York before seeing a gallery painting and stating, “I can paint like that.” Completely unschooled in the arts, he began painting and unlocked a natural talent. Davis died in 1978, but collectors still vie for his artworks! This painting measured 24″ by 18″ (the frame added 6 inches to both dimensions), and was in need of minor restoration, but was in good shape overall. 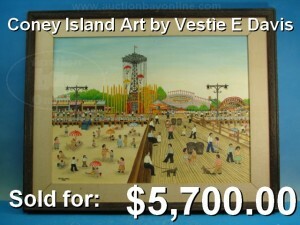 With a starting price of just $3,500.00, we let the auction run for a week, and it was bid up to a final sale of $5,700.00! When it comes to selling art on eBay, the artist’s name means everything. Artworks from a listed artist will sell for significantly higher (and with a greater likelihood of sale) than art made by lesser known individuals. In this case, the combination of a popular artist and a collectible subject matter combined for a great sale, even with minor condition issues! Give us a call at Auction Bay, and we’ll give your artwork our Free Item Assessment, and maybe yours will bring a strong sale on eBay, too!